You can bring a “gigantic sandwich” to Greenpointers but you can’t force them to eat it. 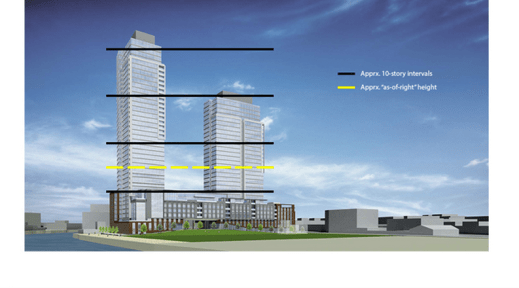 Once again last night, local residents dragged themselves to a Community Board 1 meeting, this time to speak their mind about the waterfront complex known as 77 Commercial Street. Already, the developer has full approval to build nearly 300 market-rate apartments in a 15-story tower, but nearly 500 more requested units (200 of which would be designated affordable housing) require zoning changes that must be approved by the city. If pushed through, the developers of 77 Commercial Street would also fund the transformation of an adjacent MTA lot into a public park. 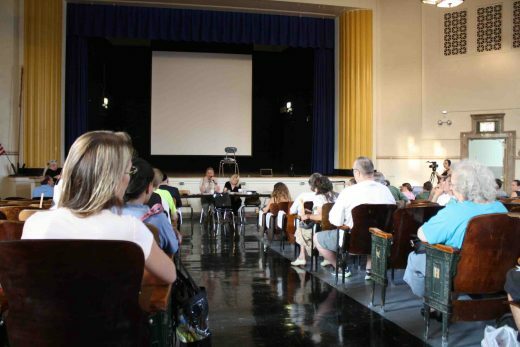 The gathering was a continuation of last week’s public session that addressed the expansion of nearby Greenpoint Landing, which would add nearly 700 units to planned residential towers and allow the city to build a 640-seat public school. Compared to that meeting, disruptions were limited last night and the crowd was thinned; but residents and elected officials were plenty vocal as they insisted the city didn’t follow through quickly enough on zoning changes made in 2005 in order to expand North Brooklyn’s waterfront access and public housing, and instead let private developers highjack waterfront development. 77 Commercial Street proposed development. The Yellow line indicates what is currently allowed without zoning modifications. Architects for 77 Commercial Street revealed that all affordable housing units were slated for the complex’s six-story high base, while market-rate apartments would be located in the 30- to 40-story towers with views of the East River and Manhattan. “Segregation!” an audience member shouted; loud boos followed. An attorney representing 77 Commercial Street guessed that developers chose rent levels and separated affordable and market rate units for “economic reasons,” which the crowd responded to with audible snickers. Richard Mazur, head of North Brooklyn Development Corporation, clarified further what true affordability meant for residents of Greenpoint. “Our families in the neighborhood are between $30,000 and $40,000, so none of these units are affordable,” said Mazur, referring to apartment rates based on an annual median income of well over $50,000. “Oh, you’re threatening us? You’re threatening us?” an audience member yelled in response. 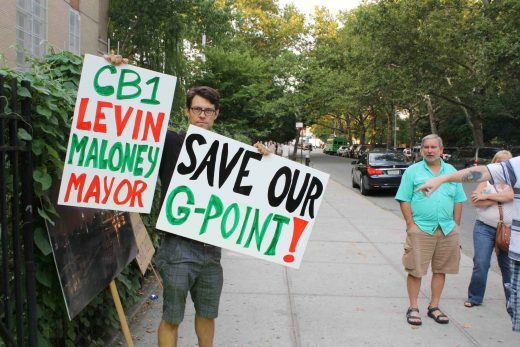 As for the development of Box Street Park, Councilman Levin blamed the city for under-allocating funds: the city’s current budget calls for $1 million to pay for the park; if zoning changes are pushed through, the city will sell an adjacent MTA lot to developers for $8 million, which they would use to develop the park. Beyond park funding and additional housing development, residents were abundantly concerned about Greenpoint’s lack of infrastructure to accommodate the population bulge. Next Tuesday, Community Board 1’s Land Use committee will meet to discuss any modifications to the developer’s requested changes. A final recommendation will be made by the full board on September 9.